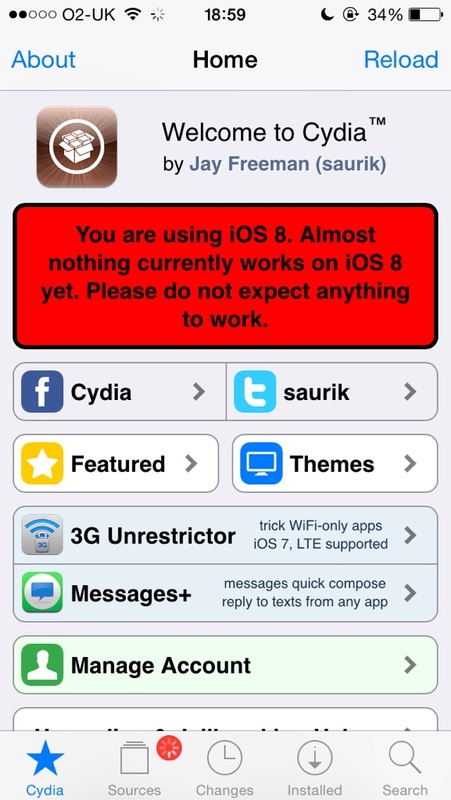 Saurik has released an iOS 8 compatible version of Cydia for manual download following the release of an untethered Pangu jailbreak for iOS 8 - iOS 8.1. I've given a new version of Cydia Installer in the form of a standard jailbreak bootstrap for inclusion in a new version of their jailbreak. I've also pushed the .deb of the iOS 8 version of Cydia to apt.saurik.com for manual download, but not yet to my repository. A lot of thanks goes out to limneos, who tested the new build for me, as I was at an airport (and now am frantically typing this message while they figure out how to retract the jetbridge from the plane I'm on that is about to take off). Recently the Pangu8 jailbreak was released for Windows only, and without a compatible version of Cydia. Now that the compatible Cydia deb has been released you can download it from here: http://apt.saurik.com/debs/cydia_1.1.13 ... os-arm.deb. It's likely that the Pangu8 jailbreak utility will be updated to include Cydia very shortly. If it's not, we may post a detailed tutorial to help those who aren't familiar with SSH.